Dr. Claudia Sonder leads a mini horse to safety in the aftermath of recent fires near Napa. As a community, I know we all grieve the loss and devastation associated with the multitude of fires in northern California that our regional neighbors are experiencing. 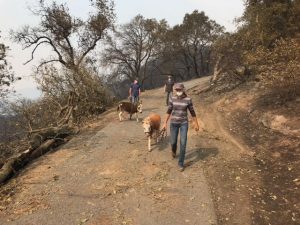 In times of natural disaster, we stand ready to assist the animal victims and their owners caught in the path of these fires. We have a number of activities already underway and resources available to respond to official county and state requests. We provide our assistance to address regional needs as we have always done in times of necessity. A rendering of the exterior of the future Equine Performance Center. This week we launch a new beginning for our school as we “lead the way” toward the future of veterinary medicine. Our plans and dreams for a new Veterinary Medical Center build upon the legacy of our past and the vision of our future. The need for these improvements has been amplified with this week’s fire disasters, as our facilities harbor those animals in need of our care and offer relief for our neighbors through our outreach programs. We seek to create the future, by building on the accomplishments and dreams of those that have come before us, building new trails in research discoveries that advance the health of animals, people, and our environment.